The RISE indicators for 2017 offer a full suite of reports and data for 111 countries. The energy access section contains 8 indicators (see Table) with 29 sub-indicators, based on 59 questions. They can be roughly categorized as (a) planning, (b) regulations for system types, and (c) economics and finance. Each indicator, scored between 0 and 100 and stop light colored, measures how far a country is from offering an attractive policy environment. Grid is a common roadblock. A framework for grid electrification (Indicator 3)—the mainstay for universal access progress—has the most countries (33) in the red zone. This covers provision of dedicated funding, rural subsidies, consumer finance, and performance standards. Many countries are not planning. 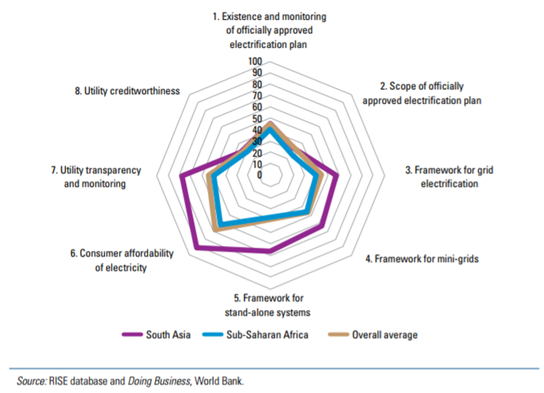 44 percent of countries—primarily fragile, low-income, often in Sub-Saharan Africa—do not have electrification plans. Those with plans are tracking. 90 percent of countries with an officially approved plan have established a dedicated entity for monitoring progress. Affordability is a barrier. In just over half of access-deficit countries, electricity is unaffordable for the poorest people. Transparency is uneven. Across all four segments (retail, distribution, transmission, and generation), around 50 percent of the utilities make their financial statements public. Among the four key performance metrics, the transmission loss rate is the least available. Utility creditworthiness is poor. Only 11 countries are in the green zone while 27 countries are in the red zone. What Can Be Learned from Rise or Used In Future Decision-Making? The RISE “scoring” is likely less useful for future policy and regulation design and development than the rich databases that underlie the project. 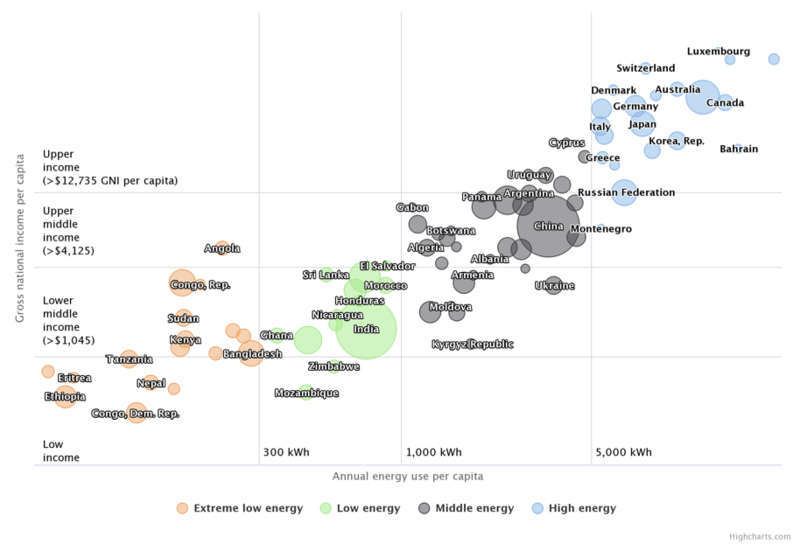 Policy frameworks for grid densification and expansion, the mainstay of electrification efforts, remain insufficient for the scale of the challenge, including increased urbanization. Financial viability of utilities is a core problem, with follow-on impacts for investment, service delivery, quality of supply, etc. Energy access is one of the keystone development metrics. But how do we define "access", and what limitations does this methodology have?